A dense, rounded shrub with a profusion of snow-white flower clusters along gracefully arching branches. It has small blue-green leaves that turn an outstanding coppery-bronze in fall. This refined looking shrub is attractive to butterflies. 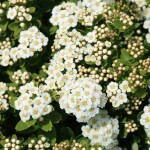 It is easily grown in full sun to part shade in an average well-drained soil. Prune after flowering as needed.